1. Papp K.A., et al. Risankizumab versus Ustekinumab for Moderate-to-Severe Plaque Psoriasis. N Engl J Med. 2017 Apr 20; 376:1551-1560. 2. World Health Organization. Global Report on Psoriasis. 2016. Available at: http://apps.who.int/iris/bitstream/10665/204417/1/9789241565189_eng.pdf. Accessed on February 6, 2019. 3. National Psoriasis Foundation website. About Psoriasis. Available at: https://www.psoriasis.org/about-psoriasis. Accessed on February 6, 2019. 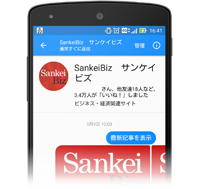 SankeiBiz © 2019 SANKEI DIGITAL INC.